That rant echoed a headline three months earlier in Inman News that predicted, Zillow’s new ‘coming soon’ feature puts pocket listings on steroids. If pocket listings result in class action lawsuits someday, as Sam DeBord posited in his column on January 22, 2014 in Inman News, think the explanation above meets the legal test of “informed consent”? Rather than manipulating buyer with fear of loss, what if the law required agents to record themselves as they explain risks or loss of benefits of agency options before buyers or sellers give up their right to be represented by their own agent, without conflict of interest? 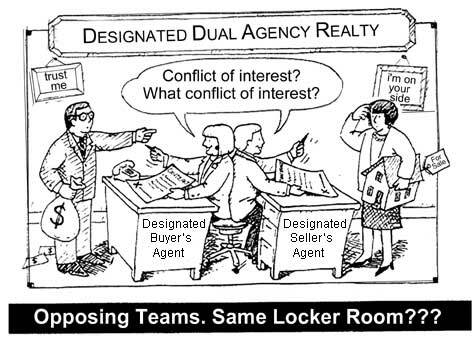 Think many agents could provide sufficient information to obtain informed consent — Or is the industry so immersed in conflicts of interest that they see nothing wrong with the picture above? Or what if the tables were turned and homebuyers present their own contract terms which agents could accept — like the Pledge of Allegiance authored two decades ago by the State of New York. Or better still, what if buyers and sellers could simply exchange their own IntentCasts pre-MLS and involve agents if and when they want, at a price the consumer sets? To some extent, that’s already happening with and without the benefit of technology.